I am back and settled into a routine after my English Channel attempt. Well, the truth is that it was no attempt at all. Mother Nature decided it was not my time. Luck played more of a role in this objective than I figured but I still feel satisfied with the outcome. Did I want to swim the Channel? You bet. Was I disappointed in not being able to swim? Yes, to a degree. I met some fantastic people, learned a good bit about the swim conditions, and picked up some excellent tips for future marathon swims. The journey, in other words, made the outcome tolerable. A quote - misattributed to Ralph Waldo Emerson - sums up my thoughts on this objective. Everything in life is a journey if you choose to adopt that perspective. Each objective, goal, or striving I identify and seek presents me with opportunities to see the world, meet great people, and learn from the experience. Learning is the main reason why I want to climb, swim, and sail to exotic locations for long periods. I learn about myself along the way. The English Channel taught me something I didn't anticipate - I enjoy the journey often more than the destination. Given that I was unable to even attempt the swim, I still feel fortunate. Why? I have learned more in that one week in Dover than I could learn in any book or during any swim. The marathon swimmers both taught me and entertained me. They welcomed me and my family with open arms. I feel completely indebted to them and intend to repay them in kind. From the first step onto Dover beach, I knew I was with my kind of people - the ones who extend a hand without knowing you. They were warm and friendly from the start. 1. ESPN (of all web destinations) has an excellent summary of the three events - complete with some details not found in most other sources. 2. A list of all swimmers who completed the triple crown gives you a good idea about how rare the feat is today. Sure, there are 119 people on the list (as of Sept. 16th, 2015) but that ranks as rare in the world of endurance challenges. 3. What can be worn during the swims? I get that question all the time - well, at least frequently over the past few months. Here are some (un)official rules that govern some events. All events in the triple crown abide by them. No swim for this tide. Sorry to get your hopes up with that title. Neil just gave me a ring and the weather just refused to cooperate. The swim is off. I really appreciate all the support and look forward to my return. When? Not sure. Guaranteed I will be back and might even return sooner than later. If anyone out there knows how to register for the MIMS and Catalina Island swims, I would appreciate some tips. Next year might be more exciting that this year...without earthquakes and avalanches. Expect pictures from the wedding. Thanks again for following along. Hey all. I just got off the phone with Neil (my pilot) and he gave me the run down for the upcoming days. Today is bad. The winds and waves are not favorable today - at least not this morning. Later today may work out but it doesn't look promising. Tomorrow, the forecast is about the same as today. No sense stressing about it. I plan to go for a swim this morning, retire to our favorite restaurant for a bite to eat and then chat with Neil to see if the conditions change. Maybe afterwards I squeeze in a nap to make today perfect. Don't worry about my mental state. I am in good shape and look forward to this and other adventures. The aim here is to make the most of what I have available. How many times do I get to swim in Dover harbor? Not many. Off I go! See you shortly with any updates. See below? I'm smiling....sort of. OK, off to swim. Title says it all. I am down to two more mornings (and one afternoon) and tomorrow morning doesn't look promising. Just got off the phone with my pilot boat captain - Neil Streeter - and he gave me the go-ahead to enjoy a pint tonight. The morning does not look good. I trust him completely. We just ran out of luck so far. Monday was a dream day and the days following turned sour for us. Oh well. I have two more chances - tomorrow afternoon and Friday morning. Fingers crossed that something works out. I remain hopeful even if the odds are shifting out of my favor. On the bright side, I get to see my friends Sam and Alex in just two days. That reunion will be special. The swimming in Dover harbor was simply amazing today - just as it had been the previous days. 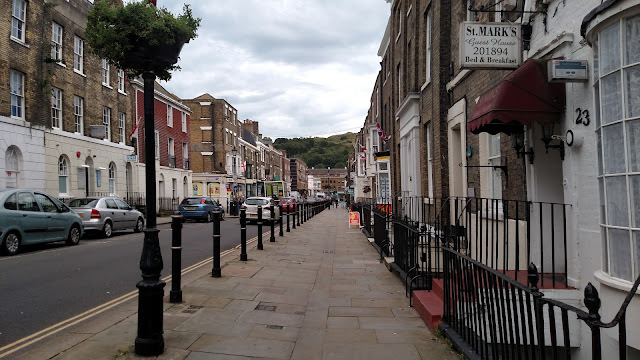 Reflecting on my time in Dover and the training proceeding my trip, I have a few things I learned. First, I am fit and ready to swim on three months training post climbing in Nepal. I think any more time preparing might have lead me to burn out. Also, gaining the extra weight helped a ton because I can tolerate the cold(er) water without any ill effects. Second, marathon swimmers are an awesome group. I cannot believe there are so many nice people who do one sport. If we all took a few tips from the folks here in Dover, my LOST friends in Oakville, Ontario Canada, and the countless English Channel swimmers I met along the way, the world would be a nicer place with less hate and more love. I cannot express in words how grateful I am for all the support and kindness shown to me and my family over the past 5 months. Thank you all. A great view from the swimmer's beach in Dover harbor. There I am...smiling while waiting my turn. Today's choppy conditions gave me a good taste of what might be in store for me while crossing the channel. Hopefully I get that chance this year. If not, I am already thinking about what lies ahead for me. Perhaps Manhattan Island Marathon Swim (MIMS) followed by Catalina Island Marathon swim and another shot at the English Channel. Hey, now that is an idea! A triple crown in one year. Kat would prefer I not return to Everest this year just to give us all a break. I agree with her; I need a break and so does she. We were just talking about this idea during dinner tonight. She seemed somewhat psyched about this challenge. So, what do you think? I know my friends in San Diego would lend a hand for Catalina Island. Swimming around Manhattan might be a little creepy. OK, more thoughts on that challenge soon. Time for bed and then another morning dip in the harbor. Fingers crossed I get a chance to swim the channel this year. Expect another update shortly. I am laying down in our awesome room nestled deep in the heart of the Churchill Guest House. It is breezy today and I feel completely comfortable after my morning dip in Dover harbor followed by another outstanding meal at Il Rustico. 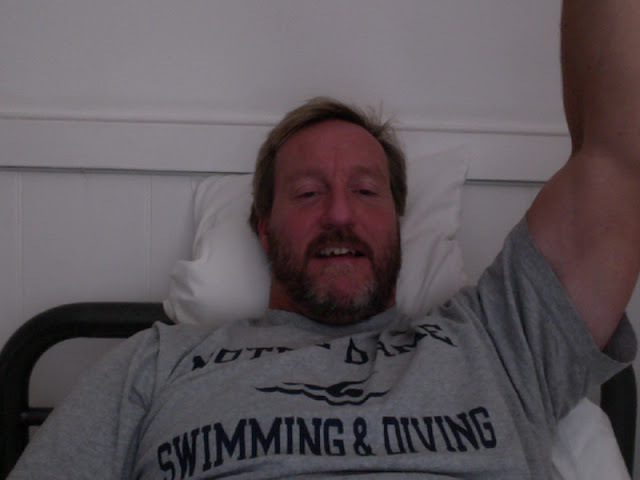 Each day - save for one - I swam in the harbor for at least an hour and then enjoyed a leisurely day of naps and meals. We are ready as a crew to tackle this swim but the wind and waves seem to have different plans. As we wait, I wanted to give you a brief update. Below are some pictures from the past few days. As you can see, we are enjoying ourselves. A view up Castle Street - the street that amazingly enough heads up to the castle. Go figure. One of our early meals at Il Rustico. I believe we ate there every day so far. If you find a winner, stick with it. Dover Harbor - the place where all the channel swimmers come to get accustomed to the water (wind, waves, and temperature). Hey, I know that guy. I am relaxing today because I thought I might swim the next day. No use tiring myself out. Kat swam for the family. There she is...Kat swimming in one of those seal costumes. ...and she was playing the part of seal very well. Here, Sean is lending a hand and helping Kat and her new friend out of the water. Actually, he just offered them their shoes so they wouldn't have to walk upon the tough rocks with cold feet. I have no idea if I will get off for my swim. The beauty is that I remain optimistic and relatively care-free. It has been an outstanding event so far even though I remain uncertain. The people here are wonderful. I met the King of the Channel (aka Kevin Murphy - the Honorable Secretary of the English Channel Swimming & Piloting Federation) along with many swimmers - both old and young (well, relatively young and certainly young at heart). 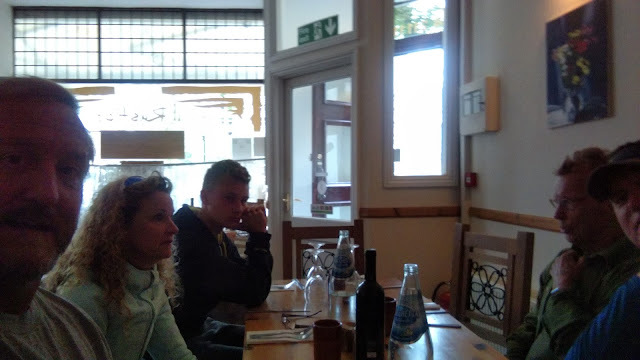 Also, my family and I have become fast friends with the proprietors of our B&B (Alastair, Betty and Alex Dimech); they are gracious hosts and tell outstanding stories - some that will crack you up for years to come. 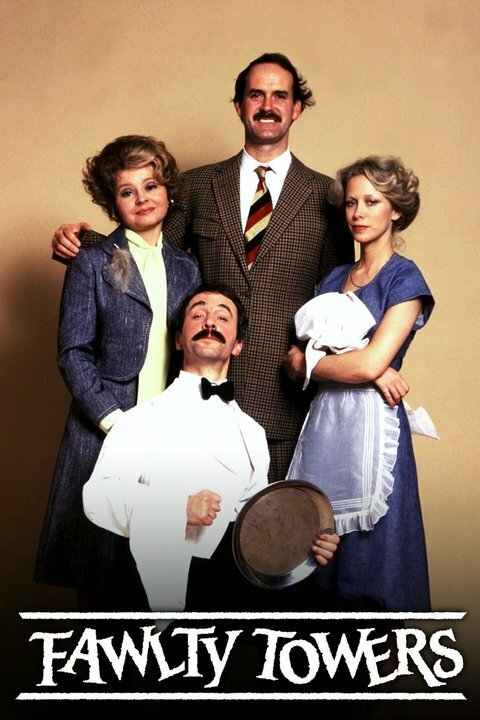 If you have any interest or ever watched Fawlty Towers, then you must come and spend time chatting with them. They are wonderful people who love to laugh and have stories that will remind you of Basil Fawlty - all good stories. At any rate, I am just biding my time. I hope to be able to swim before I head off to Sam and Alex's wedding. The swims in Dover harbor have been magical but they don't satisfy my yearning to swim to France. 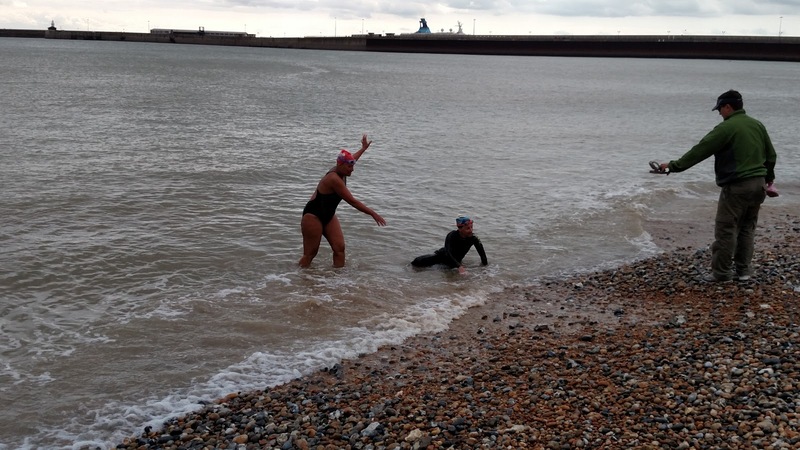 If the swim doesn't materialize, I will return to Dover in the near future to give it a real go. Yes, these setbacks can be expensive and irritating but if Mother Nature forces my hand to abort, then I must and return I shall....soon. Everest will be 3 times (I hope no more) - fingers crossed the channel does not take that many tries. Stay tuned for more updates shortly. Tomorrow is another day but the weather looks foul. Perhaps I get out on Thursday. Don't know yet. I think I'll take a nap. Thanks for following along. My heart goes aflutter...and we're off! The day has come when I head off to the UK to swim (and then celebrate with my friends Sam and Alex during their wedding...and afterwards). I have looked forward to this day for many months but now it is a reality. What made it even more real was that my pilot boat Captain Neil Streeter tried calling me during one of my meetings today. My phone went wonky so I was unable to answer it but his call alerted me to the fact that this swim is on! I just got off the phone with him and he thought I was in Dover already. Too bad. The weather is prime for a dip in the Channel. If I were there now, I would be swimming this evening. Alas, I am not. I'm now free from meetings for a bit and can focus on this update. From this point forward (well, actually after I hit submit), I won't have much to report other than I intend to swim in Dover harbor during the days when I will not be swimming to France. Once my swim is over, we might head up to London for whatever time Mother Nature allows. My focus now? The swim. I am so excited right now I could run around the block like a madman but I shall not. Instead, I will remain dignified and pester my family with my nervous energy. Yes, my heart went aflutter. I thought the call was a go for me immediately. Once I get the real call, I will have Kat email the blog to indicate the start. Be sure once you get the email to check out the SUVA tracking on the Channel Swimming & Piloting Federation webpage (see previous post). my awesome coach at GMU (Cheryl Ward) who emphasized good stroke mechanics and positive attitudes throughout my training. Cheryl gives us great workouts that never repeat. Yep, I cannot recall even a set that was a repeat from years ago. She keeps the workouts fun, challenging, and productive. I wouldn't be in the shape I am without her help. my GMUP lane mates (Elaina Moy, Paul Grecco, Stuart Booth, Bob Hansen, Stu Williams, William Sax, Betsy Geddes, Katie Cosgrove, Katie Layton, and many others I might not remember at the moment but will include as they come to me) who always push me and put up with me through every practice. the L.O.S.T. group who selflessly put aside their own training to help out a complete stranger. 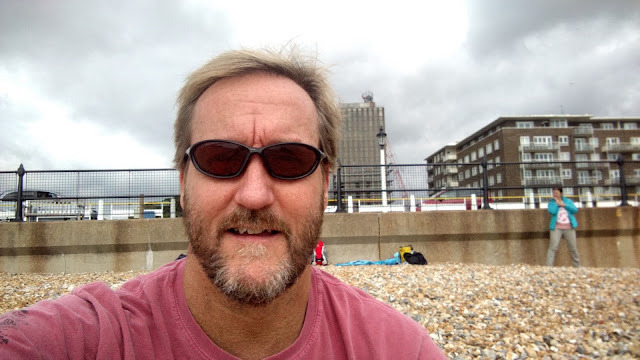 In particular, I am deeply indebted to Madhu Nagaraja, Loren King, Rob Kent, Mark Bintley, Mike Morton, Lynn De Lathouwer-Rodgers, Christine Hui, and Ross Shepherd who either swam with me or helped setup my qualifying swim. When I return from the UK, the first road-trip I intend to take is up to swim with the LOSTies for their Saturday morning swim. Oh, and one other thing. 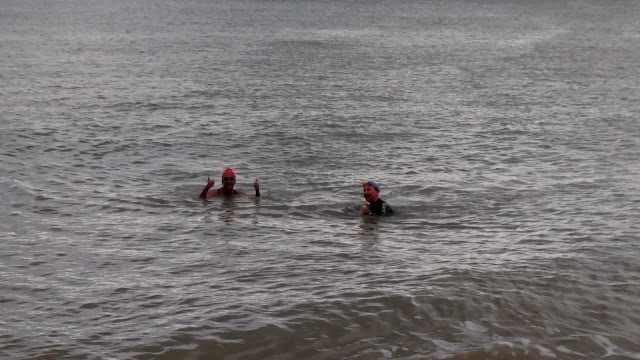 Christine and Ross came out to swim while they were training for what sounds like one of the most incredible races. Please support them on Sept. 7th by following them at the following website: http://www.otilloswimrun.se/live/ I am sure they will crush this race. Read about the race, cheer them on, and then toast them for a job well done. the L4 swim group who put up with us wayward souls from the GMUP masters team. Every August, our pool shuts down and we are left homeless. For some, that month off provides a great opportunity to rest up and recover from 11 months of swim training. Timing of the shutdown, however, was not ideal for me. I had to find another place to swim and Sandy Veatch - along with the rest of the L4 group - offered me challenging workouts with a fun atmosphere. Thanks everyone for welcoming me again for another month. Can you set up a call to give him some advice or email? Maybe you want to do it together? The rest was history. Toby noticed an open slot on SUVA and I grabbed it. Without Sam or Toby's help, I doubt I would be swimming this week. All of these people - and others including my family and friends - made this opportunity and preparation possible. I was really tired after the Nepal trip and figured this summer would be one filled with beer and chips; instead, I swam. For that change, I am indebted to you all.